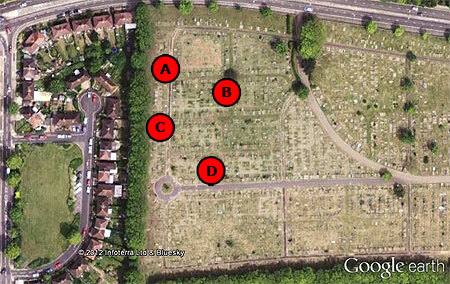 A few months ago I posted a detailed analysis of bomb damage in Ocklynge Cemetery in Eastbourne. Hove Cemetery also suffered bomb damage, some of which is still evident today. While Ocklynge suffered from just one bomb, Hove's burial ground had three, but I found far less damage despite four extensive searches. It started with my finding a brief BC4 (incident) form in the archives; this described the events of the evening of 9th August 1942 when a series of nine bombs fell in the Old Shoreham Road area of Hove. Three Heinkels (identified by sound only) came in at about 6,000ft from the south east, circled the town and dropped some illuminating flares. Circling again, an estimated 500-600 incendiary bombs rained down over a wide area causing some damage. This was followed by nineteen 50kg and two 250kg bombs, nine of which (eight 50kg and one 250kg) fell in and around Old Shoreham Road. However, the documents conflict on details. The BC4 mentioned that the anti-aircraft defences had engaged the raiders, and so I took a look at the records of the local batteries. Something else these documents reveal is that one of the raiders was shot down at 23:09 - about five minutes after the bombs were dropped on Hove. This Heinkel crashed at Worthing. It also appears that a Junkers Ju88 was shot down by Bofors fire. Delving into the Light Anti-Aircraft (LAA) regiment's war diary, we find that the Ju88 was shot down in the Newhaven area. The Heavy AA regiment's diary records that the credit for shooting down the Heinkel was shared by four 3.7-inch batteries. This was not the only confusion caused by conflicting sources though; the number and locations of the bombs in the cemetery are also contested. Bomb fell in cemetery. Damage to headstones etc. No bodies disturbed. It's useful to know that headstones were damaged; it gives us some indication that there might still be some evidence. In terms of dignity, it was a relief to know that the damage was not deep enough to disturb the deceased. Unfortunately, we have no grid references or other location indicators beyond the fact that these bombs landed in the cemetery. 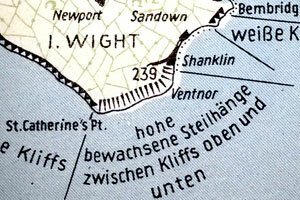 But there are other sources; the first of these is a bomb map produced by the local newspaper The Argus in 1946. This places four bombs in the cemetery as plotted at right. Seeing that the official records only list three bombs, I was immediately skeptical as to the map's accuracy. My first visit to the cemetery based on these locations yielded absolutely no evidence whatsoever. I actually scoured a much wider area, to no avail. However, a lack of landscape evidence does not automatically mean that the map is completely wrong; the damage might have been repaired, or I simply failed to find it. I retreated back to the archives, fearful that the post you're currently reading would never materialize. I was glad to have subsequently located an official map that plotted three cemetery bombs as seen at right. The red plots are the same as above from the Argus map; the green plots are the official map. It is immediately apparent that red 'D' pretty much matches green '2', but the other red plots are seemingly way off. The green bomb numbers are the official incident numbers. Does being an 'official' document make this second map any more accurate though? You would think so; the official BC4 forms list three bombs, as does the official map. It would perhaps partly excuse my inability to find damage as I had only examined one third of the actual bomb locations. A further three visits were made to try and establish extant landscape evidence; I even had the good fortune to speak to a former grave-digger who had worked at Hove a few years ago - but he was unaware of any bomb damage. The official map eventually produced some results, but it was hard work as the damage was far more subtle than I had encountered at Ocklynge. All four visits failed to find any damage around bomb number 2, so we'll focus on the possible evidence for bombs 1 and 3. The official map did allow me to have more confidence in the areas I was searching and it was only a matter of minutes before I had located the first damaged headstone (right). As with Ocklynge, it was the most obvious damage that opened the door into the landscape evidence. The 7cm pock-mark on this stone was the largest I was to find, but only half the size of the largest Ocklynge marks. As I had found at Eastbourne, strong sunlight made it easier to identify damage, so my second visit in pouring rain only located a few marked stones. My third visit was in sunshine and so more of the damage began to emerge - it still didn't make the picture clearer though, as will be discussed below. To date I've found 27 headstones that display evidence of splinter marks; there may well be others, but even with my experience of Eastbourne, most of these were hard to find. I've numbered each damaged headstone from 1 to 27, broadly from west to east across the cemetery. 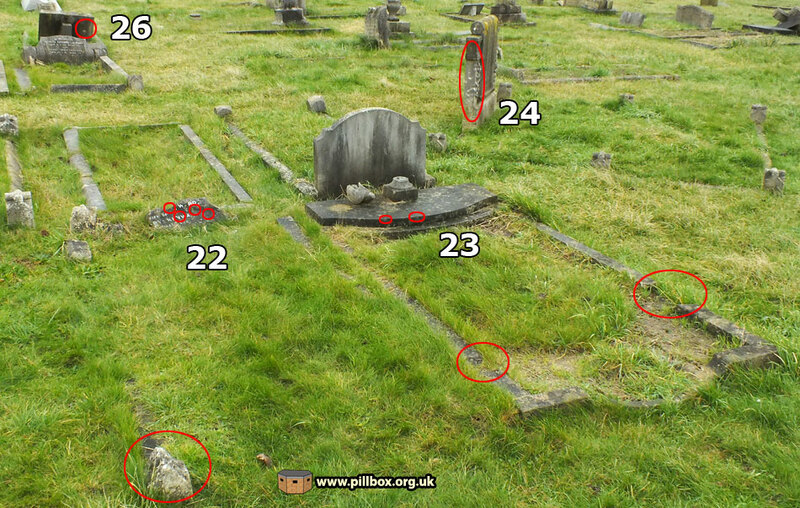 The photos of graves follow this numbering sequence and a map at the bottom of the page shows each one's position. However, you don't need to see the map until you've read that far down, as the text will only relate to graves that are in the same photograph. I was not surprised to find that the damage in Hove Cemetery was similar to what I had found at Ocklynge; mostly pock-marks from splinter impacts and some evidence of repairs, as seen in the photographs below. 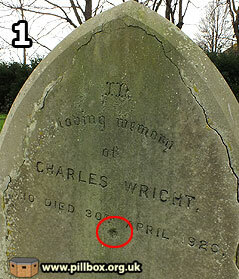 Look at the photograph below; the first damaged stone I found was no.15 (seen above), the second was no.16. As the damage to these graves faces each other, I automatically assumed that bomb no.1 had detonated between them in the area marked by the 'X'. This is pretty much where the official map places it. 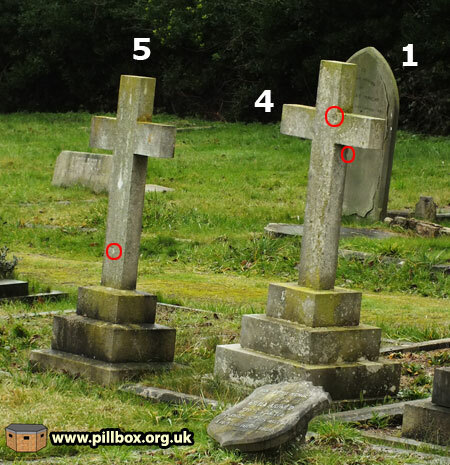 The confusion arose when I found damage to graves 9, 10 and 11 on the faces seen below, obviously on the wrong side for a bomb exploding at 'X'. It's all very well trying to locate damage, but I was finding it in all sorts of odd places, such as edges and corners and it was getting confusing as to how these different headstones related to a particular bomb. I then stumbled across the group of graves (9 - 11) shown in the photograph below. 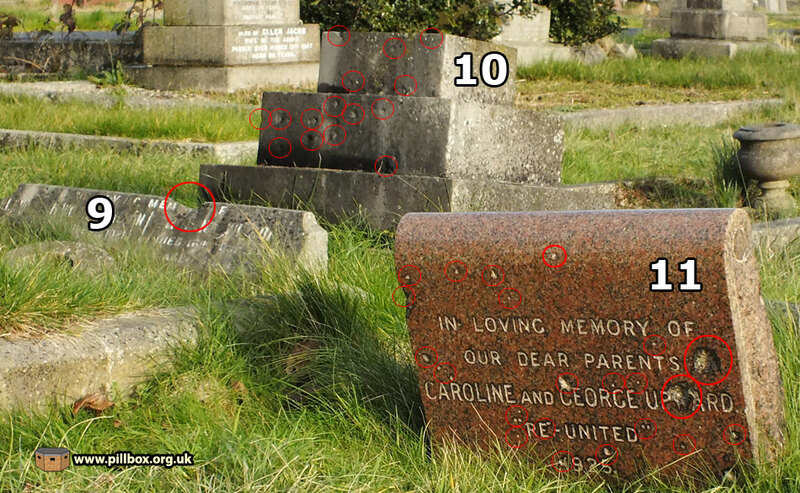 It was the shotgun effect on 10 and 11 that was of interest to me, as I had seen it on a few stones at Ocklynge. These had been quite close to where I think that bomb exploded, as the smaller fragments producing this effect would soon be spent and unable to dent granite slabs. I reasoned that Bomb 1 must be quite close to this group. Taking it a step further, note how the top left corner of 11 seems to have shielded the bottom right corner of 10 from being hit - at ground level they line up nicely, making allowance for their skewed state. 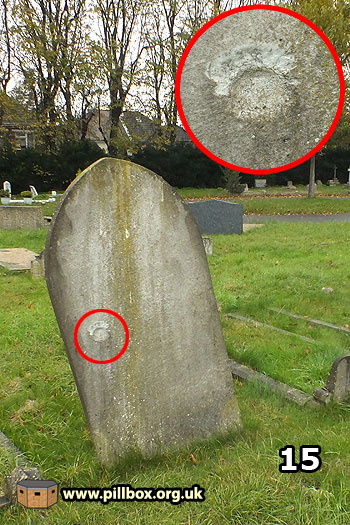 The fact that a lot of these stones are at odd angles is due more to natural subsidence, as this is seen all over the cemetery. By lining up the damage on 10 and 11, I could get a rough idea of the angle from which the splinters came. Taking a few steps back, I placed my rucksack down at where I thought the bomb might have exploded. 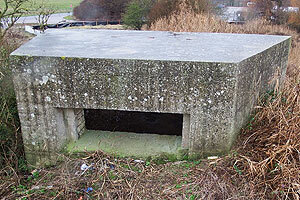 The advantage in Hove's case is that all bombs hit the ground; I didn't have to estimate in three dimensions as I did at Ocklynge, where the bomb burst in mid-air. After a few adjustments of my rucksack, it was at a spot where it seemed that all the known damage was visible. This technique proved successful, as it then allowed me to look along possible trajectories and identify potential damage. Look at the photograph at right of graves 5 and 4; until I was looking at them from this angle, I hadn't realised that grave 1 might have damage on it. Look again at the photo below; I believe the bomb was in the vicinity of the rucksack, as this is the place where all the known damage in the immediate area can originate from. This can only mean that grave 15 was actually struck by Bomb 3! The photo below shows Bomb 1's impact. The trajectories go to the known damage; note how a blue line from Bomb 3 strikes grave 15. I had found graves 24, 25 and 26 already, but had not considered where the bomb might actually have hit. Grave 24 was particularly useful in this respect as being a relatively thin slab, it was only damaged on its edge, indicating the direction. As it had shotgun damage, the site couldn't have been too far away. The photograph below shows the scene. Grave 23 appears to have lost its headstone, possibly due to bomb damage; the upright stone visible belongs to the grave behind, but it bears no marks. Although the first burial in that particular plot predates the bomb, another interment listed on the stone is postwar, meaning that the slab might be a replacement. It was then that I found grave 22. Or rather, the shattered remnants of the headstone, seen in the photograph at right. 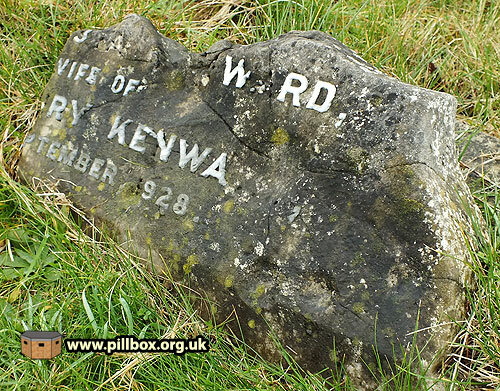 It was quite sad to see that the inscription had been all but lost and no repair or replacement had occurred. It is evident that this grave took the full force of the bomb; the headstone has been snapped in half, one half being lost/buried or hidden in the grass. One huge impact across the top lip and several smaller dents have fractured the stone almost along its length. This is the most severely damaged stone I've seen in either cemetery in relation to its size. I wasn't expecting to find a stone in such poor condition. Using the same technique as before, I arrived at a possible detonation point. This was actually on what used to be a path that formed a grid system. The paths in this section have since been used for burials, a practice also employed at Ocklynge to completely fill every available plot. This does make it hard to navigate using cemetery plans though. The scatter for Bomb 3 is shown in the photo below. 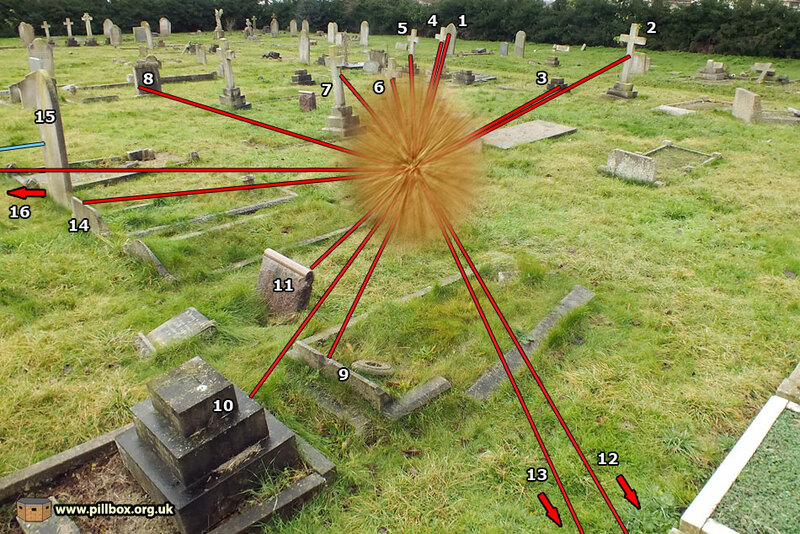 This estimated impact point took account of the angle of grave 24, the close proximity to grave 22 and a clear flight path to grave 15 that misses grave 16. 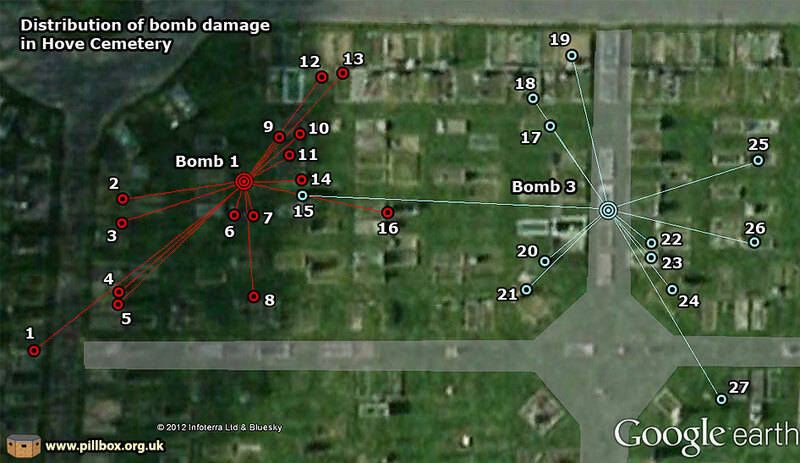 The graphic below shows the scatter of damage from Bombs 1 and 3. Once I had got my head around the incongruity of graves 15 and 16, the rest fell into place. I mentioned above that some of the paths had been used for recent burials; I've faintly added these paths below so you can still see the graves. It should emphasised that this is the known damage according to what I've found; splinters would have been scattered in every direction without marking stones. Also, the plots affected here are mostly dating from the 1920's and 1930's and include many low monuments. The damage seems to be rising up as it moves away from the explosion, but if no taller stones are present to 'catch' and record the data, a false impression of extent is created if most of the graves are only 1ft high. On the other hand, stones right beside explosions have seemingly escaped damage altogether; these might have been completely replaced or perhaps they did survive unblemished. I've seen graves at Ocklynge obviously unscarred while neighbouring stones were hit; bomb blast and ballistics are seemingly random in these matters. There are quite a few postwar burials up to the 1970's in these areas at Hove and at least two stones had to be accounted for as having been erected after the bomb when observing the trajectories of splinters. For a blog post about bomb craters, it's time to mention something of them. Why, even after four attempts, could I find no evidence of Bomb 2? The craters made by Bombs 1 and 3 are recorded as 5ft wide by 2ft deep. The crater made by Bomb 2 was 5ft by 2ft 6 inches deep - could those extra 6 inches have made a difference? If Bomb 2 burrowed even a little deeper before exploding, more of the energy and splinters would be absorbed into the earth. It may be that Bomb 2's damage was all repaired, or I've missed it. Having said that, enough evidence of Bombs 1 and 3 remains to allow me to have pinpointed their probable impacts. These bombs might have hit hard surfaces, such as grave slabs or a gravel path before exploding - there isn't enough documentary evidence to indicate this. I've established that even the official map isn't precise in its placement of Bombs 1 and 3 - but they are large spots on a small-scale (6-inch) map and they did lead me to the general area. But it's actually quite evident that the authorities weren't really interested in these cemetery bombs as the explosion of three 50kg bombs wasn't anything new. Correspondence about the events of 9th August 1942 in Hove is purely concerned with finding out the effects of another 50kg bomb that blew out the front of a semi-detached house in Olive Road, which is just beyond the cemetery; this was the next bomb in the stick. Both of these houses had a Morrison Table Shelter installed, and the boffins wanted any data available about their performance. 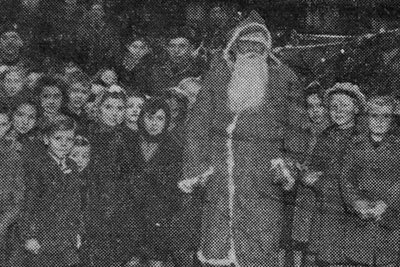 Similarly, another report was filed about the destruction of the entrance to a school air raid shelter a bit further up the road. Again, the 250kg bomb that did this was probably from the same aircraft. How do these two incidents compare? The damage at Ocklynge is more widespread and with a larger number of damaged graves. This is down to two reasons; namely that the bomb was 250kg (five times the weight of those that hit Hove) and it was an airburst that allowed the damage to spread out to about 160m from the explosion. 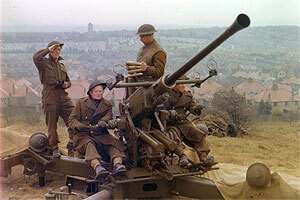 The 50kg bombs that fell on Hove all had part of their force absorbed into the ground, hence the formation of craters. Bomb 1 damaged grave 1 at a distance of 20m, while Bomb 3 damaged grave 15, 22m away. The graves affected at Ocklynge included quite a few Victorian monuments that tend to be bigger and more likely to 'catch' splinters than the predominantly low-lying headstones of the 1920's and 1930's that are found in the plots damaged at Hove. The Victorian stones were also less likely to have been repaired or replaced, but at Hove, the 'recent' burials that only predated the bombs by 10-15 years were probably more likely to have been replaced at the request of surviving family members. We've seen how the documents describe the enemy aircraft as being three Heinkels to a mixture of 15-20 Heinkels and Junkers; the number of bombs and their locations have also been in dispute. I placed reliance on an official map to the point that I got into a mess with what the landscape evidence was telling me. The lesson is that every source needs to be treated with equal suspicion until multiple sources start to reveal what can be claimed as the historian's best interpretation of events. The examination of this incident has been almost forensic in its nature, but there is still plenty of room for error in what I've done. 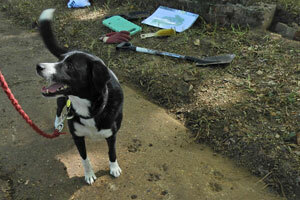 However, I'm confident that I've uncovered the locations of two bombs in Hove Cemetery - and two out of three can't be bad!